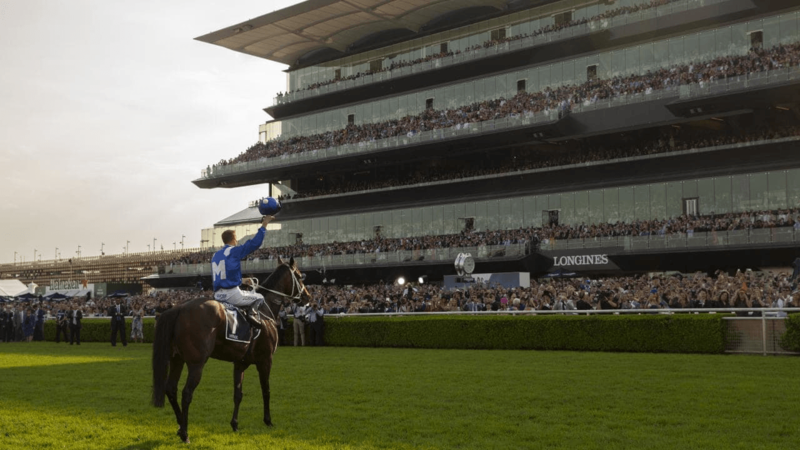 As has become customary over the past few years, jockey Hugh Bowman let Winx settle from her outside draw, ranging up on the far outside about mid-pack near the halfway mark of the 2000 meter turf race (just less than 1 1/4 mile), where she stormed home in her usual fashion at odds of less the 1/9. In the end, Winx, the remarkable Australian super horse, was merely laughing at her eight overmatched rivals, speeding up as if she were a sports car, shifting into high gear at the finish to the delight of a 40,000-strong throng of admirers as she crossed the finish line. It had come to be what fans were expecting, and what the seven-year-old “Wonder from Down Under” continued to deliver without fail. In the final race of her career Saturday, the Queen Elizabeth Stakes at Royal Randwick, near Sydney, Winx secured her 33rd straight victory, setting a world record not soon to be forgotten, let alone eclipsed. At Royal Randwick Saturday, many in the crowd wore blue, the colors of her owners, to honor the horse they believe is one of the all-time greats. After the race, Winx took a farewell jaunt around the track saluting the fans. Then she was greeted near the winner’s enclosure by the other riders and horses for her sendoff. The only challenge to Winx’s remarkable legacy is from those in other parts of the world who wish they had a chance to see her compete in a different racing environment — the daughter of Street Cry never raced outside of Australia. Will the decision to stay home be detracting from her reputation because former Aussie champs such as Phar Lap in 1930’s and Black Caviar earlier this decade did win races abroad? But as he saw it. the stress of travel halfway across the globe wasn’t worth the risk. For Winx’s complete record on the racetrack, click here. Winx’s next career will be as a mother. Her owners have yet to decide which stallion, local or international, she might be bred to. Race fans are anxiously awaiting the decision and looking forward to seeing her offspring on the track. Assessing her career as a broodmare, meanwhile, provides something for race fans to look forward to several years in the future.